Welcome back High Hopes Fans! I had some fun playing with a High Hopes Easter stamp this week. How cute are these two?! When we were kids we used to put dye and water into a mug and let the egg sit until it was coloured. There was a special wire handle that came in the kit to put the egg in and out of the mug and fun stickers to decorate the eggs with. Of course, while we were waiting for the dye we would make a huge mess with everything we weren't using . I had to use the fun paint splatter paper on this one! This stamp sure brought back some fun memories! 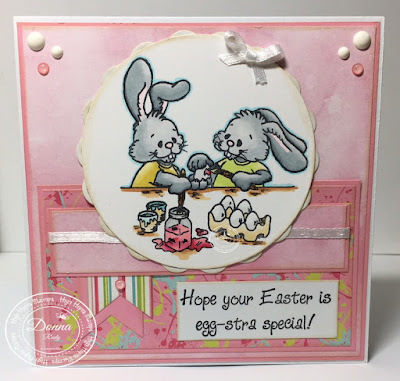 After the stamp was coloured with alcohol markers, I cut it out using a classic circle die and then cut a scalloped die to go in behind it. The patterned paper pieces were cut to the size I wanted and placed on the card. Antique linen distress ink was put on all of the edges. Some fishtail banner tags were added along with some gumdrops and ribbon to finish off my card. Your adorable card sure brings back memories of egg decorating!! 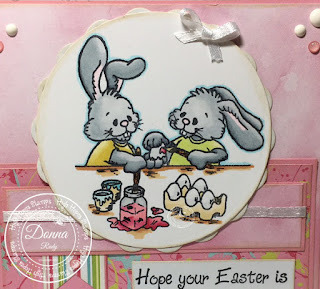 Super cute and love the papers! !